The Lisburn Area in The Early Christian Period. The publication of our Journal is costly. I wish to acknowledge, with sincere thanks, very generous contributions from the Northern Bank Ltd., and Redmond Jefferson Ltd. Both companies have provided valuable service to the community for over one hundred and fifty years. Four members of the Society, who wish to remain anonymous, have also made welcome donations to assist with the publication. Trevor Neill. 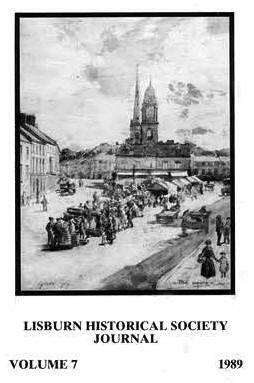 The Square, Lisburn, watercolour by David Gould, 1919. Printed by The Universities Press (Belfast)Ltd. Since the publication of our last Journal in December 1956, we celebrated our twentieth birthday in November 1987 by the holding of a dinner in the splendidly refurbished Assembly Room in Lisburn Museum. This event had to be postponed for several days as on the original evening, terrorists chose to attack the R. U. C. Station in Castle Street, and a large part of the town was immobilized for some hours. Thankfully, tragedy and damage were averted and the dinner finally took place during the following week. Dr. Alan Gailey of the Ulster Folk and Transport Museum was the principal guest, as he had been twenty years before, when he encouraged the people of Lisburn to set up a historical society. When Dr. Gailey first suggested we form a society, the Assembly Room was uninviting and almost bare. Now, however, it is elegant and gracious, and an important part of the Museum, of which Lisburn Borough Council - and indeed the inhabitants of the town- have full reason to be justly proud. An expanding collection and interesting exhibition programme make this small museum an important and commendable asset to the community as a whole. During the past two years, the Society has maintained a lively programme of lectures and summer outings. Particular thanks must be paid to a number of individuals: to Mr. F. O'Sullivan, our extremely efficient and imaginative Outings Secretary, who has opened many new doors for us; to Mrs. Judy Cinnamond, who has helped the Society in countless ways and whose artistic abilities arc a great boon; and to my wife Jean, for her support and encouragement. Thanks also to Eileen Black, whose stringent editing has raised this Journal to new heights. At the time of writing, it is hoped that the Society will shortly be able to appoint an Indexer, to prepare and arrange for publication an index of the Lisburn Standard and the Lisburn Herald. The Society has the best holdings of these newspapers outside of the British Library - knowing exactly what they contain should prove a great asset to those interested in the history of the district, whether schoolchild or earnest local historian. Finally, it is with regret we mention the death of two of our members: George Simpson, on 7 November 1987 and W. S. Milne Jess, on 20 February 1988. The latter was a foundation member of the Society, had served as Vice-Chairman for a time and was also a member of Lisburn Borough Council a number of years ago. Both men spent their working lives in the linen industry. Their passing is a loss to the Society. I should like to thank all those involved with the production of this Journal, but especially the contributors. Commissioning articles is probably the nicest-and certainly the easiest! - part of an Editor's job. Determining content in this way is a fulfilling and creative outlet for anyone working in an editorial capacity. Re-writing, cutting and changing scripts is not so pleasant but has its compensations, when an article is finished and ready for publication. This year's Journal contains a very wide range of material, from the development of Lisburn bus transport in the early days of the century to an old lady's memoirs of her childhood in Glenavy. It is to be hoped that the public will support and enjoy this issue, as they have done in the past. particular thanks to those involved in the money aspect of this magazine-to Trevor Neill, Fred Rankin and H. A. Duff, who run around drumming up funds and paying the bills! Without such work, the Journal would never appear in the first place. The death of Jack McCoy, Local History librarian in the South Eastern Education and Library Board at Windmill Hill, Ballynahinch, in November 1987, was a considerable loss to local history. Jack gave of his best to everyone, without exception. He knew of the Historical Society's field of interest and in his continual researching, frequently passed on items of interest to us. These often came unexpectedly (and as such, were all the more pleasurable), and heightened our resolve to explore the line of enquiry more fully. I suspect this was one of Jack's subtle ways of encouraging and strengthening our interest in our own locality. His epitaph is everywhere, being the knowledge he acquired and passed on to us and to many others. The generosity of spirit with which he carried this out and his belief that knowledge should be shared, was an inspiration to us all. It was a pleasure to have known him.